Webmedia Review 2019: Is Webmedia a Good Hosting? Webmedia is a no-frills hosting company located in Croatia. Their simple hosting plan is fully customizable and offers some surprising added value. Webmedia is a Croatian company with a single budget website hosting package. The company started life in an entrepreneur’s bedroom and in 2011 and was bought by a much larger (and more premium) company, Avalon. 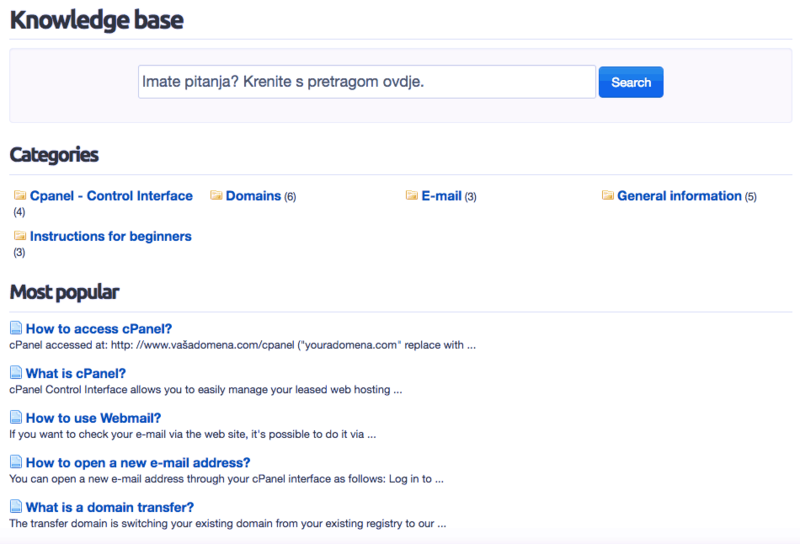 The Webmedia website is in Croatian, and their servers are located in Croatia. The first thing you’ll notice about Webmedia is the simplicity. They sell only one affordable hosting package called All-in-One. This is intentional because Webmedia aims to be a no-frills, affordable option for small websites. In fact, on their About page, it’s clearly explained that Webmedia provides “simple, fast and inexpensive web hosting services.” However, if you want more resources or have a more demanding website, you can check out the sister company, Avalon, instead. So let’s dig a little deeper into what is offered. The hosting plan comes with the easy-to-use cPanel control panel, support for PHP (version unspecified), and MySQL databases. You also get both FTP and SSH access, which is often not included even by premium website hosting companies. For beginners, the hosting comes compatible with popular CMS programs such as WordPress, Joomla, and Drupal. You can customize your hosting plan at the checkout by beginning with the base package then configuring the amount of disk space (1000MB-3000MB), bandwidth (100GB-1000GB), email accounts (10-100), and additional domains (0-10) as required. Although this obviously increases the cost, it’s nice to see this kind of flexibility from a budget brand. Finally, and surprisingly, Webmedia has an uptime guarantee backed by compensation detailed in its terms and conditions. Although the guaranteed uptime is low at 99%, it’s nice to see that it’s backed by a bona fide SLA. The Webmedia website clearly states that this is a budget brand, and the prices reflect this. Put simply, you get a good level of resources at a perfect price point. You get domain registration for free, but SSL certificates cost extra, and you also have to account for the fact that all prices are exclusive of 25% VAT (which is an additional cost if you can’t claim it back as a business). There is a 50% discount on the monthly price for the first year, so bear in mind that the price will double in the second year. You can only buy annually, but the initial annual commitment needn’t worry you too much, because – in addition to the 50% discount – you get a 30-day money-back guarantee that can get you out quickly if it all goes wrong. Webmedia is open about the fact that the customer service provision is limited. If you need 24-hour support, you should contact its sister company, Avalon. However, you can contact Webmedia’s customer support team by email, telephone, and ticket during standard weekday working hours. They also have a small knowledge base. Webmedia is a self-proclaimed budget brand. However, I was surprised to see some nice features (SSH, PHP, customization options, uptime SLA) wrapped up in a single simple plan. If you need a no-frills plan at a good price point, this could be an excellent option for you. Wondering how Webmedia stacks up against other Web Hosting companies? Enter any other Web Hosting company and we will give you a side-by-side comparison.